Urban ABQ works on policy, practices and planning to help shape Albuquerque’s built environment. We support places people love- and work to strengthen places so that they love people back. This website represents a group of advocates in Albuquerque who see the unrealized potential here. We see cities similar to ours restoring and energizing their older neighborhoods and creating places for people. We want to see more of those actions in ABQ. We know what changes we want to see but we don’t see them happening quickly enough in the local built environment. It is no accident that our local economy is struggling. There is a global urban revolution occurring in America and we don’t want to see Albuquerque get left behind. What does “urban” mean in Albuquerque? According to the dictionary, urban means “in, relating to, or characteristic of a city or town: ‘the urban population'”. According to this definition, anything related to the city of Albuquerque would be considered urban. However, much of Albuquerque is suburban, defined as “the residential area on the outskirts of a city or large town”(Merriam-Webster). A dense mix of uses truly defines an urban place vs. a suburban or rural place. When we say “mix of uses”, we don’t mean strip malls + apartment buildings + wide roads filled with automobile lanes and little else. A mix of uses, or mixed use, means having it all under one roof: residential, retail and perhaps offices as well. In older cities in America and Europe, 2-3 story buildings with this type of orientation are the norm. 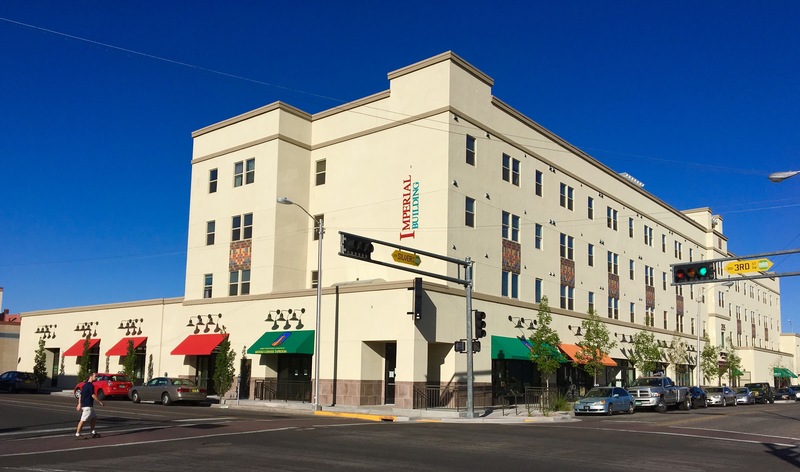 In Albuquerque, this style of development can be found primarily in Greater Downtown and along the Central corridor. The recently completed Imperial Building contains a grocery store, a brewery, restaurants, affordable housing, a rooftop garden and many other amenities. It is an example of “urban”. Who said Albuquerque needed to be more “urban”? The long term traffic trends paint a grim picture for Albuquerque. According to MRCOG, the regional planning agency, all of the Rio Grande river crossings will be at complete failure by 2035 (PM Peak Hour Traffic Projections, 2035). This means that they will be in constant gridlock, especially during rush hour. This is a result of the fact that most jobs are (and will continue to be) on the east side of the river, according to current projections. However, most residential growth in the past couple of decades has been on the west side of the river. The housing/employment divide is projected to continue growing, leading to eventual gridlock. There are significant policy changes that need to be made in order to make Albuquerque more urban, walkable and people friendly. It is no accident that it is easy for developers to build new subdivisions on the Westside, while people attempting to bring energy to the older portions of Albuquerque hit roadblock after roadblock, lengthening the process, increasing the cost and sometimes giving up completely. Much of the recent investment in the older portions of Albuquerque, including Downtown, has only been made possible by heavy public subsidy. What if we made it easy to renovate old buildings Downtown for affordable housing instead of our current policies, which favor building big, new houses in the Petroglyphs? On top of that, our older neighborhoods lack basic amenities such as sidewalks, street trees and other elements that lead to vibrant, happy and healthy neighborhoods. What policies need to be changed to prioritize improvements in these critically important neighborhoods? The most viable solution, in our opinion, is increasing density on the east side of the river. The most efficient and cost effective way to prevent this predicted gridlock is by creating higher density mixed use development, mostly on the east side of the Rio Grande. This type of development will not happen everywhere, far from it. Residential neighborhoods will remain, for the most part, untouched. Downtown, the Central Corridor, the San Mateo Corridor and other major commercial corridors will be the location of this high density mixed use development. Rezoning would need to happen to allow for lower parking minimums and higher density within the existing commercial strips. The arterials themselves will be reoriented with an emphasis on Rapid Ride/BRT, expanding existing sidewalks and the creation of additional bicycle facilities. This vision is not new to Albuquerque. In fact, it continues to be discussed and integrated into future plans. However, this is not enough. Without an increased speed and urgency, Albuquerque could suffer from the same fate as some of the Rust Belt cities: an empty center surrounded by half empty sprawl. This is simply not economically viable, as articulated in a recent presentation by Urban3. In this presentation, Urban3 used data to demonstrate that the center of our city, the urban parts of Albuquerque, financially support all of the lower density neighborhoods around it. The City of Albuquerque announced they would have a $24 million budget deficit in 2017. One major element of that is having more liabilities than they can afford to maintain. Unless you like getting city services cut, you should support a more urban Albuquerque too.